In the remote M’Goun Valley, high in the Atlas Mountains, early May is rose festival time. Three-four thousand tons of super-fragrant Damask and Cabbage roses are hand-picked in the valley each spring. Most of the harvest is processed into rose oil bound for the perfumeries of Europe. The rose festival in the town of El Kelaa M’Gouna celebrates the harvest with three days of music, dancing, and food, a parade, the coronation of a Rose Queen and, of course, every rose product imaginable. This week’s mystery country is MOROCCO. Click to see Morocco tours. 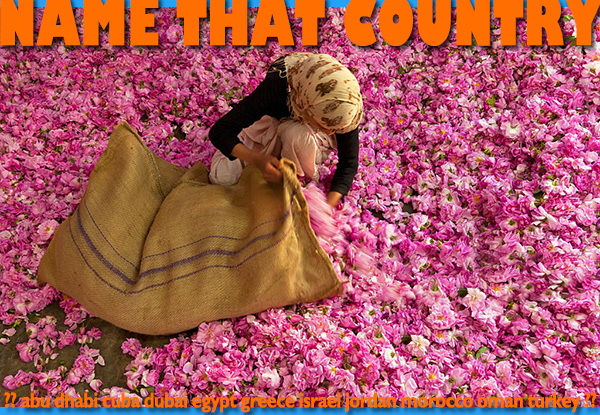 This entry was posted in Morocco, name that country quiz and tagged el kelaa m'gouna, m'goun, rose festival by yalla2013. Bookmark the permalink.